Simply Silhouettes has changed the world of silhouettes, with an array of customizable products. No need to settle for a plain old silhouette , Simply Silhouettes offers custom silhouettes to suit ever customers needs. Whether you're looking for wall art, jewelry, a calendar or stationery, Simply Silhouettes has it. Simply Silhouettes is giving away one 8x10 custom print to one lucky reader! What is your favorite Simply Silhouettes product? 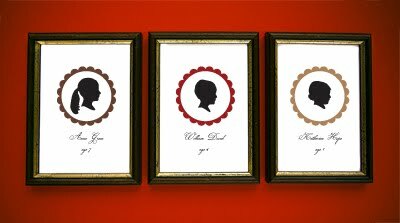 I have been eying their silhouette Christmas cards. Ohh I love silhouettes! I'd love to get some of my family made for my grandma. love love silhouettes! Great giveaway Dee Dee! I would love to have one of these of my daughter! So cute! One of my mom's most cherished possessions was a pair of silhouettes done of me and my sister by an artist at Disneyland. Silhouettes are so cute! I really fell in love with them by reading NieNie! I am a new follower via Google Connect! Love silhouettes! Want one soooo badly! I have been wanting some thing like this for a long time SO Cute! that's really cool! Hope I win. I received a gift of a silhouette of my son when he was a baby. I would love to have one of my baby girl now. I would love to win this! so neat! Ohhh - I need this, pick me. What an amazing giveaway. I do love the Christmas cards (if I didn't already have mine made for htis year!). I'd love to have one of my sweet baby! I've been wanting silhouettes of my little lads for ages! Love the look of these, so classic! I'm a new follower to this blog! OMGosh...I've always wanted one of these! Thanks for hosting such great giveaways! This would be a great family heirloom of my children. these are great. count me in! These are stunning — I love the one of the father and baby! Thank you for the opportunity to win! I'd love to have one for scrapbooking. LOVE LOVE LOVE. The Christmas cards would be awesome! I love silhouettes. If I win one then I don't have to attempt this on my own.